The Lowdown: Confident performances, laced with easygoing laughs, by three seasoned stars are sabotaged by broad, cartoonish hijinks and questionable ethics. 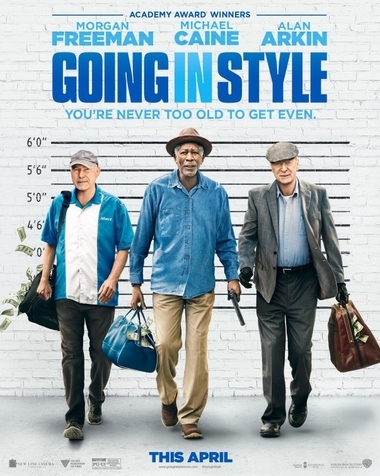 Credit for the new crime comedy Going in Style being as watchable as it is goes to its trio of Oscar-winning stars: Morgan Freeman, Michael Caine, and Alan Arkin. Director Zach Braff has remade the 1979 film of the same name as a Grumpy Old Men-with-guns mainstream comedy. It even features Ann-Margaret as Arkin’s love interest, almost a quarter-century after she romped with Walter Matthau and Jack Lemmon. 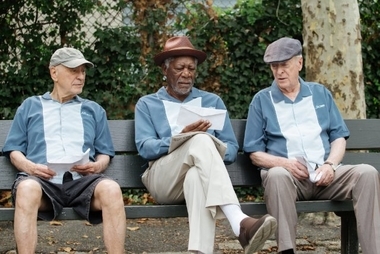 But the wrinkle added to Style that was not part of the Grumpy flicks: these seniors are aspiring criminals. They feel they’ve been taken advantage of, what with their pensions disappearing when the company they worked for changes hands. The basic premise of the Martin Brest-directed original hasn’t changed—even the names of the main trio have been retained. Joe (Caine) is about to lose his home as his adjustable-rate mortgage has skyrocketed, pushing him into default. 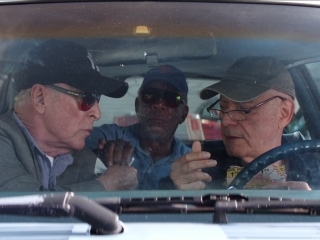 He proposes a wild idea to his best friends Willie (Freeman) and Al (Arkin): why don’t they rob a bank? Where Braff’s film differs drastically from Brest’s is that his film focuses on the planning and execution of the heist itself. Joe, Willie, and Al enlist the help of Jesus (John Ortiz), an apparently experienced criminal who runs a pet shop as a front. Since the camaraderie between the lead trio is obvious, there are plenty of throwaway lines that garner gentle laughs. Problems arise whenever select side characters are given room to mug wildly. There’s the squirrelly bank manager (Josh Pais) who screams like a baby during the robbery… the security guards at a discount grocery store who chase down Joe, Willie, and Al during a practice run… Christopher Lloyd as Milton, a senior center denizen with Alzheimer’s (one of the most tasteless “comedic” avenues desperate filmmakers are known to mine)… These detours turn Style into a tacky, live-action cartoon. Theodore Melfi’s screenplay (the same Melfi recently Oscar-nominated for his work as writer-director of Hidden Figures) takes a few passing shots at character development. Al scrapes together a few extra bucks teaching saxophone lessons, but girlfriend Annie (Ann-Margaret) once saw him play with Stan Getz in his heyday. Joe has a granddaughter (Joey King) who means the world to him; he’s more a father to her than her deadbeat dad (Peter Serafinowicz). Willie has failing kidneys, a disease he has hidden from his friends. But none of these threads amounts to much. By the time Style drops a child into the FBI’s robbery investigation, forcing her to become an accomplice to Joe and the gang, it’s easier to sympathize with Agent Hamer (Matt Dillon) as he tries to put these aging bad boys away.